Yet, Coinbase, the Silicon Valley’s crypto & blockchain darling, has sought to change this. Well, that’s according to Brian Armstrong, an Airbnb software developer turned Coinbase founder and diehard decentralist. In a recent tweet, Armstrong, who has quickly become crypto’s de-facto face in the Bay Area, showed his firm’s unique efforts at testing physical, viable cryptocurrency products. In a short fifteen second video, a presumed employee of Coinbase used his/her device and an iPad-turned-Point-of-Sale to use Bitcoin Cash (BCH) to purchase a glazed donut. Yum! The integration, which likely utilized beta versions of Coinbase’s in-house wallet, coupled with a merchant-side offering, accepted BTC, BCH, ETH, and Litecoin (LTC) — the four mainstays throughout Coinbase’s broad roster of consumer, merchant, and institutional products. The example transaction stipulated in the video was completed in a mere 15 seconds, a rapid time likely aided by BCH’s zero-confirmation transaction protocol and system often employed by merchants accepting the asset. 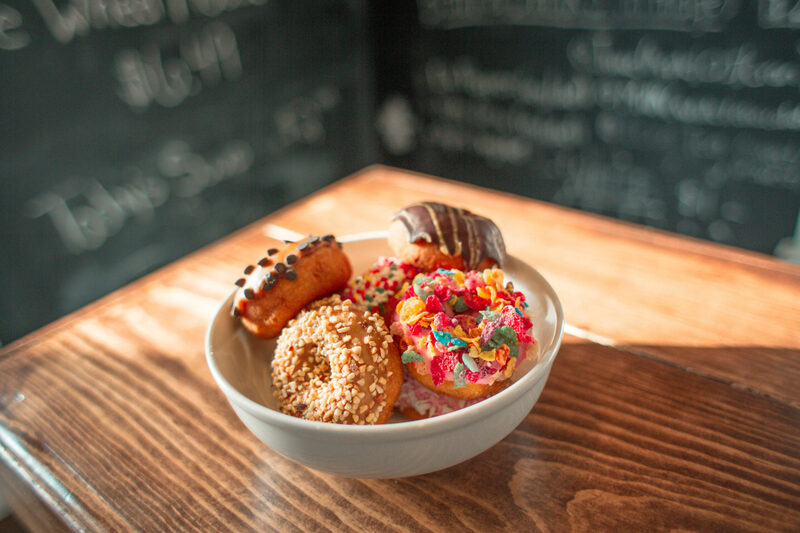 While the so-called “pop-up donut shop” had a good premise, with Armstrong writing that his company was “doing more user testing to improve usability,” some took to the comments of the tweet to bash the San Francisco-based company’s efforts. Dude, it’s 2019. We’ve had database transactions since the 70s. Explaining his point, the industry insider noted that a “simple database transaction” isn’t the way in which companies should onboard consumers into crypto, even explaining that Coinbase’s efforts are futile and that the company could eventually experience qualms, just as Bitmain is right now. Peter McCormack, a Twitter personality with a popular crypto podcast, jokingly asked Armstrong if his ‘shop’ takes 0x (ZRX). In the same vein of quips, Lil Uzi Vertcoin asked if Coinbase’s pseudo-store takes cash. Others were less influenced by hilarity, posting critical comments on the integration, which was deemed lacking by cynics. I am Nomad, a pseudonymous crypto trader, and DogePreacher, a Canadian Dogecoin maximalist and blockchain technologist, both noted that the Coinbase shop was clearly lacking the use of the Lightning Network, a second-layer scaling solution that can facilitate near-instant, effectively free, scalable, secure, and immutable transactions. Seeing that Lightning continues to swell at an astounding rate, growing from close-to-zero nodes to thousands in a year’s time, many were appalled by Coinbase’s inability or decision to stave away from embracing the scaling protocol. Others even criticized the video itself, noting that the video was doctored to show that the transaction was completed in mere seconds, rather than the presumed minutes. While this was rebutted by a skeptic, who analyzed the video frame-by-frame to reveal that the seeming ‘cut’ was just bad videography, Coinbase was still bashed. Interestingly, there were some that appreciated Coinbase’s efforts. Crypto-friendly venture capitalist Fred Wilson, the co-founder of Square Union, noted that he “loved that.” Seeing as Wilson expects for upstarts to launch notable, paradigm-shifting products in 2019, it is obvious why he is encouraging of such pro-adoption efforts. It seems Coinbase developers have nothing to do. It would be better to improve the security system and protect your customers first! Why would people ever want to buy donuts with a highly volatile digital currency when cash, credit, and debit are simpler options? Other than the novelty of it, this is just plain dumb. Brian stop eating donuts! How about listing XRP? or it was an idle talk like everything else? That cinema in brazil sounds better than coinbase donuts.